Last weekend we got to go out to celebrate hubby's birthday. 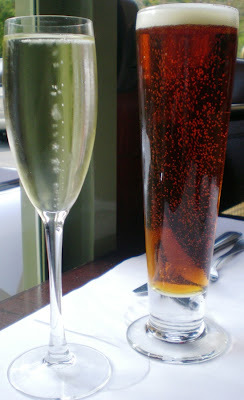 Hubby got a glass of Octoberfest Beer, and I got a glass of Prosecco. 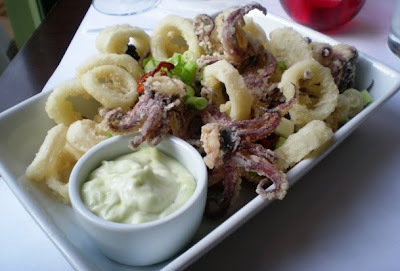 We sat in the bar area again and ordered from the small plates menu. 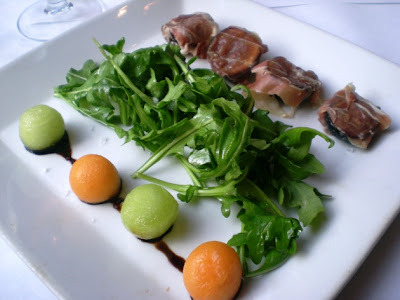 We ordered Prosciutto Wrapped Figs with arugula salad and melon balls. The saltiness of the prosciutto went very nicely with the sweetness of the figs. The melon balls sat on a balsamic vinegar reduction, which was a very nice combination. And I loved the bitterness of the arugula. We also got the French Onion Chicken Flatbread with caramelized onions, bacon, chicken, Gruyere, & scallions. It was a tasty dish but a bit too salty for me. Andrea, you just took me back to Italy and now I am STARVING! Basically, everything you ordered were foods I ate on a regular basis in Italy. I absolutely LOVE arugula, especially fresh sprinkled on pizza! Prosecco and Secco are 2 of my favorite wines, mmm! No weekend plans here, just relaxing and catching up with life! A great meal to celebrate! That cake looks amazing! 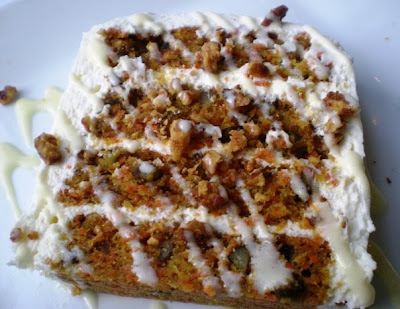 Oh My Gosh that carrot cake looks AMAZING! I love carrot cake, it's probably my favorite type of cake really. I like not having plans sometimes, but then there are those weekends when I DIE to have plans! tonight Nick and I are going to my friend Michelle's house for an Italian dinner, so exciting. Then tomorrow I'm OFF to Denver! Weekend plans MAY include hiking (depending on the weather), running (same), and lots of football. Yum! I love everything - especially the proscuitto wrapped figs and flatbread! p.s. you won the free Silk Heart Health coupon! I love the way the two of you order several items and share...so much more room for adventure that way. I love ordering from the appetizer list. This is the first weekend that I think of as cold in our area with a light drizzle. That kind of weather drives me inside for cooking, movies, and knitting! Beautiful food! Sounds like a good time! 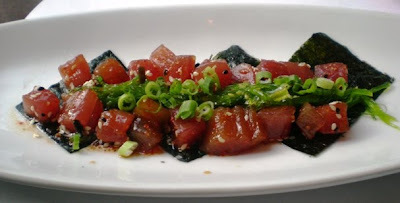 I think I would have order four more dishes of that tuna. Ho-lee that looks good. I'm actually soft on plans this weekend too. Last weekend was so crammed. But I will run! That I am determined to do. Loved the baby pic early this week too. What a cutie. mm that flat bread sure does look delicious :D loves it! next time you eat THAT meal, well, CAN I COME to DATE NIGHT? except...never tried the wrapped FIGS...are they great? I need a date night! Love how you make time for you and the hubby! This weekend we are going to a friends chili party, yeah!! No cooking for me and a fun time for the kids! Looks like a fancy date night :) Nice place, good food! That's the way to do it ;) I hope my husband and I always remember to do date nights post-kids. I hear it's a life-saver! Looks like a great night out. Glad you enjoyed it. Our plans nnow include hanging out and relaxing before my week gets incredibly busy next week.